I have a question about using ACTH stimulation testing to confirm primary hypoadrenocorticism (Addison's disease) in dogs. 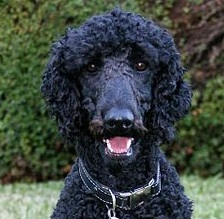 My patient is a 9-year old female spayed Standard Poodle (weighing 25 kg) that was diagnosed with an acute Addisonian crisis at an emergency hospital. At the time of clinical presentation, she was very weak and had collapsed, and had been anorexic for 2 days; physical exam revealed severe dehydration with a normal heart rate (100 bpm). Routine laboratory workup showed hypoglycemia (glucose, 46 mg/dl), mild azotemia (serum creatinine 1.8 mg/dl), and moderate to severe hyperkalemia (potassium, 7.5 mEq/L) with a normal sodium level (142.4 mg/dl). At presentation, the owner declined an ACTH stimulation test due to the expense, so the emergency clinic only did a baseline cortisol, which was low at < 0.8 µg/dl. The dog was treated with IV fluids and a shock dose of dexamethasone. She had a good clinical response was discharged after 2 days. On the day of release, she was treated with Percorten-V (50 mg, IM) and started on oral prednisone (2.5 mg BID for 3 days, then 2.5 mg SID). Today, the owner called me and asked me about doing an ACTH stimulation test to make sure we have the right diagnosis. Is it always better to do the ACTH stimulation test prior to any glucocorticoid treatment? Can we do an ACTH stimulation test during the initial adrenal crisis? If I stop the prednisone and do an ACTH stimulation test now, will I be able to interpret the results? How long does she need to be off of the prednisone before doing the ACTH stimulation test? The owners are concerned that the dog could develop another adrenal crisis if she doesn't get the prednisone every day. How concerned do we have to be worried about that issue? To make a definitive diagnosis of hypoadrenocorticism (Addison's disease), we need to prove that the dog has inadequate adrenal reserve. As you know, this is done by performing an ACTH stimulation test, which is considered to be the gold standard diagnostic test for hypoadrenocorticism in both man and dogs (1-3). Ideally, the ACTH stimulation test would be done prior to administration of any glucocorticoid agent. The reason for this is two-fold. Reason 1— Many glucocorticoids (e.g., cortisone, hydrocortisone, prednisolone and prednisone) will cross­-react in the cortisol assay to falsely elevate the measured cortisol value. Therefore, to accurately measure a dog's circulating cortisol concentrations, the ACTH response test should either be performed before these glucocorticoids are administered or after stopping them for at least 24 hours to allow their elimination from the circulation (2,3). The only glucocorticoid that does not cross-react in most cortisol assays is dexamethasone (see below). Reason 2— Secondly, if high doses of any glucocorticoid preparation are administered, the circulating glucocorticoid will feedback to the hypothalamus and pituitary gland to shut off the secretion of corticotropin-releasing hormone and ACTH, respectively (see Figure 1). This is certainly true for dexamethasone as well, since it is a very potent glucocorticoid. In the normal dog, this will lead to an acute decrease in circulating ACTH concentrations, and within a few hours to days, lead to mild atrophy of the adrenal cortex. Remember that without circulating ACTH, the basal cortisol value will fall and the response to ACTH stimulation will also become "blunted," even if that dog is not suffering from Addison's disease (2-4). The ACTH stimulation test can be performed at time of initial glucocorticoid treatment for acute adrenal crisis, but only if dexamethasone is used for glucocorticoid replacement. Again, since dexamethasone does not interfere with the cortisol assay, it will not lead to falsely high measured cortisol values. As noted above (under Reason 2), however, dexamethasone is a very potent glucocorticoid and will act via negative feedback on the HPA axis to inhibit endogenous cortisol production. However, this effect usually takes at least 4–6 hours to be expressed. Consequently, any artifactual lowering of post­-ACTH cortisol concentrations can be avoided by ensuring that the ACTH response test is completed within 2–3 hours of dexamethasone administration (3). Overall, it is always best to delay glucocorticoid therapy until the ACTH response test is completed. This is rarely problematic, provided that concurrent intravenous fluid therapy is instituted. Once a day or more has passed and the dog has received large doses of IV and/or oral glucocorticoids, interpretation of ACTH stimulation test results becomes more problematic. 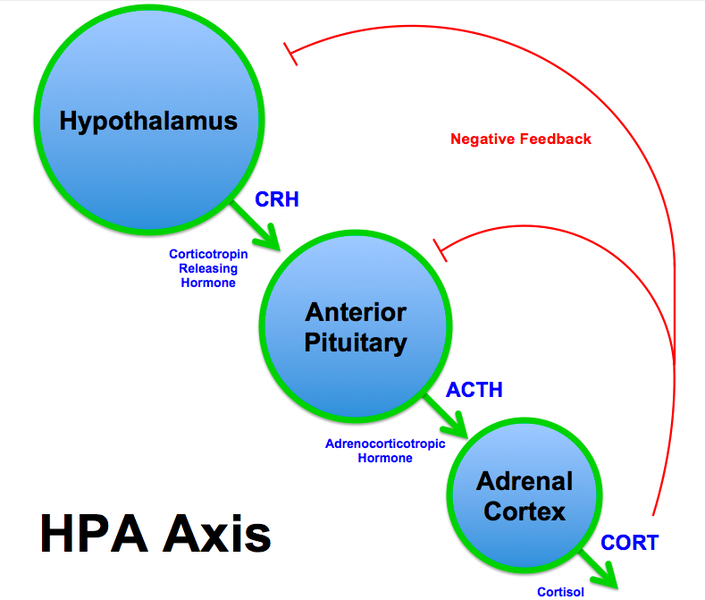 Remember that administration of even moderate doses of a glucocorticoid can result in suppression of the HPA axis and lead to mild to moderate atrophy of the adrenal cortex. Even in a dog without Addison's disease, this can result in a low basal cortisol level with a "blunted" or suppressed response to ACTH stimulation. If large doses of potent IV glucocorticoids, such as dexamethasone, have been administered for adrenal crisis, it may be best to postpone testing for a week or more to allow the HPA axis to partially recover. If oral prednisone or prednisolone is being administered, the dosage should be tapered down to the low maintenance range (0.1 mg/kg/day) for a few days. The prednisone or prednisolone should then be withheld for at least 24 hours before ACTH stimulation testing to ensure that the glucocorticoid is not detected in the cortisol assay. As long as the dog has received mineralocorticoid treatment and has normal serum electrolytes, withholding all glucocorticoids for 1 day will not result in adrenal crisis. In normal dogs administration of a supraphysiologic dose of ACTH produces a rise in serum cortisol to values usually above 10 µg/dl (275 nmol/L). In contrast, dogs with hypoadrenocorticism have an absent or blunted response to ACTH administration. Basal and post-ACTH serum cortisol concentrations are less than 1 µg/dl (27 nmol/L) in over 75% of dogs and less than 2 µg/dl (55 nmol/L) in virtually all dogs with primary hypoadrenocorticism (1-3). Similarly, the great majority of dogs with secondary hypoadrenocorticism also have ACTH-stimulated cortisol concentrations of less than 2 µg/dl. So what kind of ACTH stimulation response can we expect to find in a dog without Addison's disease that is being treated with chronic glucocorticoids supplementation? If we are lucky, the dog may show a completely normal cortisol response, thereby making it clear that Addison's disease is ruled out. However, many of these dogs will show low basal cortisol concentrations or have a slightly blunted response to ACTH stimulation. Even in the these dogs, however, their post-ACTH stimulated cortisol values tend to be higher than 3-4 µg/dl (>80-110 nmol/L). Because we know that dogs with naturally-occurring hypoadrenocorticism will have a much lower adrenocortical reserve than this, and we also know that exogenous glucocorticoids can suppress the HPA axis to inhibit endogenous cortisol production, this type of cortisol response also helps exclude Addison's disease. Peterson ME, Kintzer PP, Kass PH. Pretreatment clinical and laboratory findings in dogs with hypoadrenocorticism: 225 cases (1979-1993). J Am Vet Med Assoc 1996;208:85-91. Church DB. Canine hypoadrenocorticism In: Mooney CT, Peterson ME, eds. BSAVA Manual of Canine and Feline Endocrinology. Fourth ed. Quedgeley, Gloucester: British Small Animal Veterinary Association, 2012;156-166. Kintzer PP, Peterson ME. Canine hypoadrenocorticism In: Bonagura JD, Twedt DC, eds. Kirk's Current Veterinary Therapy, Volume XV. Philadelphia: Saunders Elsevier, 2013;in press. Kemppainen RJ, Sartin JL, Peterson ME. Effects of single intravenously administered doses of dexamethasone on response to the adrenocorticotropic hormone stimulation test in dogs. Am J Vet Res 1989;50:1914-1917. I would appreciate you advise on this intricate case of Addison's I recently came across last week. Molly, 8 year old female spayed 5.4kg maltese, that was first diagnosed with addison's at referral centre 18 February 2011. She has been well managed on florinef (fludrocortisone)and oral cortisone and gets regular electrolyte monitoring. They were concerned about primary renal proteinuria in 2012 after lots of workup (abdominal ultrasound conducted in house by general vet practitioner & full bloods & urinalysis) made them rule out most pre-renal & post renal causes for proteinuria. They offered renal biopsy or starting fortekor & O opted to start fortekor (benazepril hydrochloride). UPC didn't improve after fortekor initially started and after discussion with medicine specialist, blood pressure check recommended and her results were normal & O again declined renal biopsy. We have since been closely monitoring her urine protein:creatinine ratio as well as her electrolytes. We collect urine via cystocentesis. Her urine protein:creatinine ratio did ultimately respond to fortekor. Then she had a very high reading & dietary intervention was started (renal diet). Patient is super fussy and so she is currently on a home made diet of skinless cooked chicken 3 ounces & 3 cups of pasta & one large hard boiled egg & 4 teaspoons canola oil & half teaspoon baking soda & 1 tablet of mutlivitamin & mineral tablet kids complete & 1/2 tbalet of zince 100mg. She refuses the iodized salt. I would appreciate your guidance on the next best step in managing this case. My concerns are this patient still regularly gets seizures (stiff saw horse stance), once every 1-2 months, seem to be getting less as noted in O's seizure diary. Her UPC results continue to rise. I put patient on baytril and recommended r/v to repeat cystocentesis and do full in house urinalysis + planning to run a SDMA blood test to assess renal function & to book her in with an ultrasonographer for a full abdominal ultrasound. I would love to know your thoughts on this complicated yet well managed case. Owner is lovely and super dedicated. I am not going to be of much help. We do not see proteinuria due to Addison's disease, so this dog has another problem that is way out of my area of expertise.